Blustery with occasional showers. 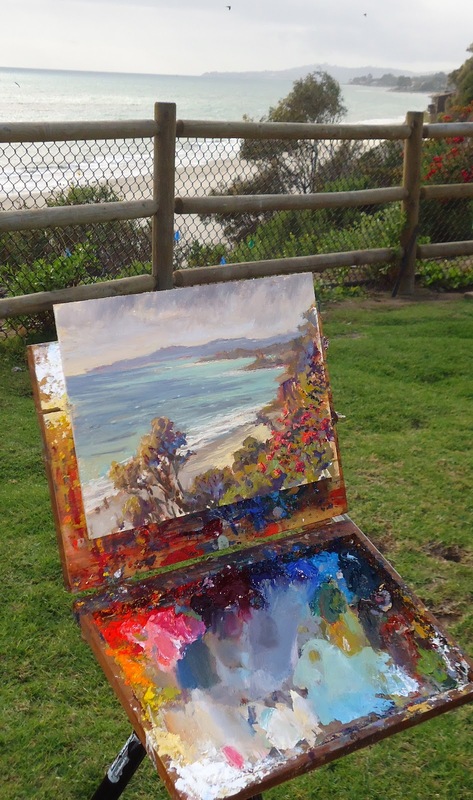 only around 1/3 of the class showed up to paint the vista from Overlook Park in Summerland, (near Santa Barbara). It wasn't so bad. I found if we set up about 15 feet back from the bluff face the wind would pass over us, making it relatively comfortable. It was a cold wind though, and those with thin skin checked out early. My demo came out o.k.. I feel I got a good start on it; that is, until I walked away... I left the painting unattended to go help a student, when the wind blew my easel over, causing a little bit of change to the texture of the clouds at the top of the painting. Fortunately, all totally fixable. Part of being an artist is knowing how to deal with the matter at hand, and to correct things that are out of place. To quote Richard Bach, "There are not problems; only opportunities to be creative!"